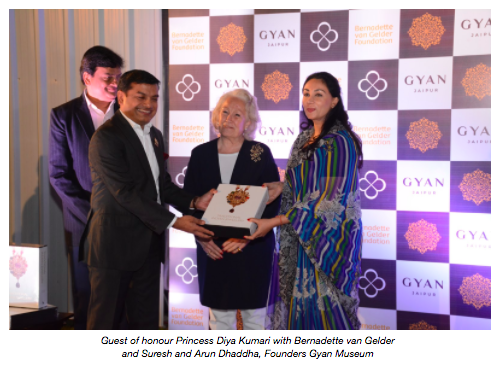 Gyan Museum, Jaipur hosted the India launch of Traditional Indian Jewellery on 28 January 2018 in the presence of guest of honour Her Royal Highness Smt. Rajkumari Diyakumari. The India launch of the publication follows the international launch at the Rijksmuseum, Amsterdam where the inaugural copy was presented to Mr Veenu Rajamony, Indian Ambassador to The Netherlands. The Netherland’s proceeds of the sale of the book went entirely to the Bernadette van Gelder Foundation, committed to Indian female empowerment. Van Gelder has a long-standing connection with the Dhaddha family who set up Gyan Museum in honour of the Late Gyan Chanda Dhaddha to house his collection which includes textiles, paintings, antique jewellery and objet d’art from around the world, dating back over 3,000 years. This publication is the result of extensive research inspired by a true passion for India and the culture and traditions of its jewellery, and is a unique illustrated archive in over 600 pages, featuring two volumes. Volume I: The Golden Smile of India and Volume II: Beautiful People.